The sky has no true colour. While most of the time it is blue, sometimes it is not. The sky looks blue but really it is made up of all the colours of the rainbow. Each of these rainbow colours has a different wavelength. Some of these are smoother while others are choppy. Blue light waves travel in short, choppy waves. Like each of the other colours, blue light waves are scattered and reflected as they enter Earth's atmosphere and collide with gases and other particles. Because the colour blue has the shortest wavelength, it collides with nearly everything in its path and is scattered about the sky. This is why the sky appears blue. The sky can often be pale blue, gray, or even white. The reason for this is pollution. Some of the example and cause of different colours of sky are as follows. 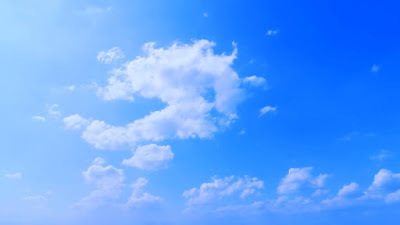 This colour of sky means the sky is very clean. This often occurs when a cold front brings clean air from the north, or when clean air from the ocean moves onto land. This colour of sky means there is lots of water vapor in the sky. It can also suggest the presence of sulfur from coal-burning operations. It may be caused by the chemical emissions of plants and trees. This colour of sky indicates considerable air pollution from coal-burning power plants or chemical power plants. This condition often occurs in the summer when the air is still. There are also natural causes, such as volcanic activity or ocean plankton etc. This colour of sky cause of the smoke from forest fires or agricultural burns. Emissions from cars and trucks can cause a layer of this colour to form over the horizon. The main component of this kind of pollution is nitrogen dioxide. In many parts of the world there is risk of a mosquito bite mainly in warms parts. But what effect does the booze in your blood have on the insect itself? 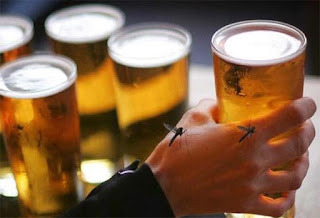 As the Journal of the American Mosquito Control Association found in 2002, the likelihood of being bitten by a mosquito appears to be dramatically increased if you drink alcohol. The study a small one, involving only 13 subjects showed those who had drunk a bottle of beer were more likely to have mosquitoes land on them to feed. Another study also found mosquitoes were attracted to those who had been drinking. The ethanol in the alcohol we are drinking and that we are excreting in minute quantities through ours sweat may be signal to the biting insects that there’s a meal nearby. If we hungry and we are walking around, More likely to make we go in one direction is the smell of food that strong smell of Mo:Mo for instance. Now we might not eat the Mo:Mo, but it shows us there’s food around there. The alcohol may ring the dinner bell, The main factors attracting the mosquitoes towards us are probably entwined in your genetic make-up. Simply saying no to an ice-cold beer probably won’t save you from their attentions. And on the plus side, at least with a drink or two, you may not feel the itching quite so much. hackers , and notify potentially affected customers so they can take immediate action. 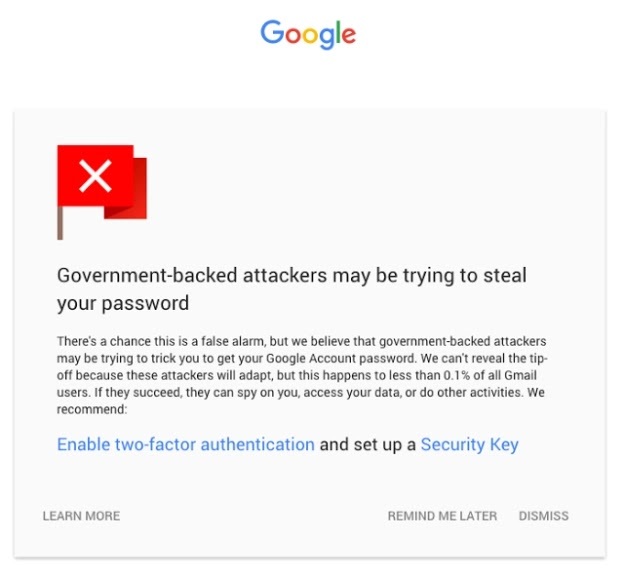 In an update on the ways Gmail is getting even more secure (which is good news in the wake of the Apple vs.
FBI scandal), Google revealed that as many as 1 million Gmail accounts may have been targeted by government-backed attackers so far. When a hack is detected, a pink Warning tab appears on top of Gmail urging affected users to better protect themselves. Google did say that these warnings are rare, with “fewer than 0.1% of users ever” receiving one. However, Gmail is not a nimble startup looking to take off. It’s a service that has more than 1 billion users as of February 2016. That means that “fewer than 0.1% of users” translates to as many as about 1 million users who may have received warnings about their email being hacked by a government. 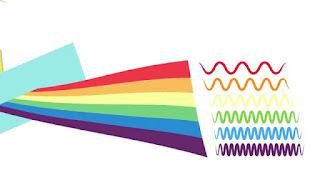 Google said that since introducing a visual element to mark unencrypted emails in Gmail 44 days ago, the amount of inbound mail sent over an encrypted connection increased by 25%. Google wants to further improve email encryption, and the company partnered up with Comcast, Microsoft and Yahoo to submit a draft IETF specification for “SMTP Strict Transport Security.” Essentially, Google and its partners want to make sure that encrypted email stays encrypted along its entire path from sender to recipient. 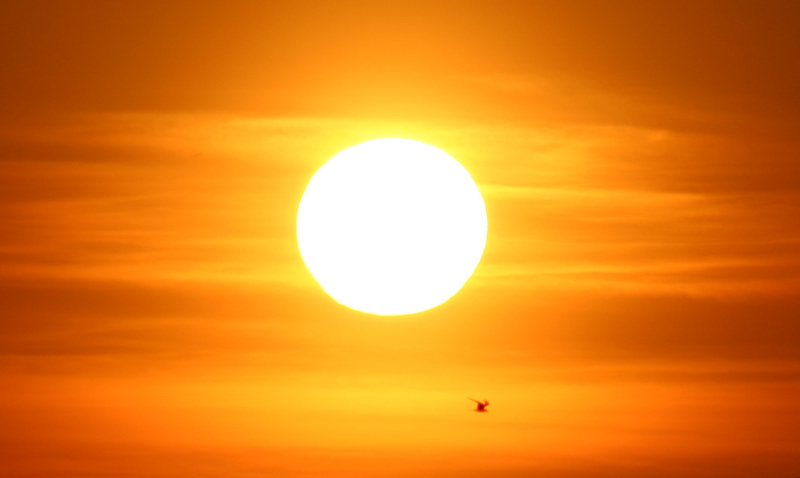 We all are know about the different uses of sunlight and how it can be beneficial for our health. We are all aware of solar technology but after going through the below article, we will all say and believe that none of us knows a thing about it. If researchers are to be trusted, all of us will soon be able to use sunlight of wash our dirty clothes. Scientists have revealed that a spot of sunshine will be required to clean our clothes and that too within minutes. They have become successful in devising a a low-cost, efficient way to grow nanostructures on textiles that can degrade organic matter when exposed to light. The research from RMIT University in Australia paves the way towards nano-enhanced textiles that can spontaneously clean themselves of stains and grime simply by being put under a light bulb or worn out in the Sun. The process developed by the team has a variety of applications for catalysis-based industries such as agrochemicals, pharmaceuticals and natural products, and could be easily scaled up to industrial levels. “The advantage of textiles is they already have a 3D structure so they are great at absorbing light, which in turn speeds up the process of degrading organic matter,” Rajesh Ramanathan from RMIT University said. “There’s more work to do to before we can start throwing out our washing machines, but this advance lays a strong foundation for the future development of fully self-cleaning textiles,” he said. The researchers including Dipesh Kumar and Vipul Bansal, also from RMIT University, worked with copper and silver-based nanostructures, which are known for their ability to absorb visible light. When the nanostructures are exposed to light, they receive an energy boost that creates “hot electrons.” These “hot electrons” release a burst of energy that enables the nanostructures to degrade organic matter. The team’s approach was to grow the nanostructures directly onto the textiles by dipping them into a few solutions, resulting in the development of stable nanostructures within 30 minutes. When exposed to light, it took less than six minutes for some of the nano-enhanced textiles to spontaneously clean themselves. “Our next step will be to test our nano-enhanced textiles with organic compounds that could be more relevant to consumers, to see how quickly they can handle common stains like tomato sauce or wine,” Ramanathan said. The research was published in the journal Advanced Materials Interfaces. What are ferrodoxins and its biological role ? 1. ferrodoxins have vital role for electrons transfer in plants and animals and serve the same function that cytochormes perform In animals. 2. Some bacterial ferrodoxins forms clustor compounds such as Fe2S4(S-Cysteine)4. There are protein bound Fe3S4 Clusters in some enzymes and bacteria. 3. The [2Fe;2s] proteins also contain Cytrine groups bound to Fe and these proteins are important in photosynthasis and gain one electron per Fe upon reduction. An artificial bacterial genome with the smallest number of genes needed for life has been created in a lab, opening the way for creating synthetic organisms with customized sets of genes aimed at specific tasks such as eating oil. The newly created bacterium, which can metabolize nutrients and self-replicate (divide and reproduce) brings the team one step closer to building custom artificial life with particular functionalities, they said. Craig Venter , founder and CEO of the J. Craig Venter Institute (JCVI), where the study was completed. "These findings are very humbling in that regard." The story starts with a genus of bacteria called Mycoplasma, germs that have the smallest genomes of any organism found in nature and tend to live in humans and other mammals. Venter said he and another of the study's authors, Clyde Hutchison of JCVI, had discussed in the 1990s what it would take to answer basic questions about the way life functions. Their conclusion was that they'd need to build an organism with the smallest genome possible. In 1995, Venter said, other researchers estimated such an artificial organism would need, at minimum, 256 genes to be viable. That turned out to be wrong – but it wasn't until now that they knew just how wrong. The team used the genome of the M. mycoides to create their bacteria. That bacterium's genome was synthesized in 2010, creating the first self-replicating cell from an artificial genome . The Venter Institute called that bacterium syn1.0. That bacterium, though, had 1.1 million base pairs in its DNA, or 901 genes. Their new bacterium has 531,000 base pairs, for 473 genes. To cut down the number of genes the team used the syn1.0 genome as a template. From there they designed a set of possible genomes for the bacterium and broke them into shorter strings. To see which genes were absolutely necessary for life, the scientists inserted genetic sequences called transposons that disrupted the functioning of a given gene. If after that the cell stayed alive, then it was considered nonessential, and snipped out. Conversely, if the cell died, then it was clear that whatever was taken out was essential. However, the process wasn't as simple as that, Venter said. Sometimes a single gene could be removed by itself, but coupled with another it became essential. Venter likened it to an aircraft: "If you know nothing about airplanes and you're looking at a 777… and you remove the right wing, the airplane can still fly and land, so you'd say it's not essential, and you don't really discover the essentiality until you remove the second one." Venter and his team added that the minimum number of genes required for life would differ depending on what organism they started with — they would get a very different result had they begun with an algae species, for example. Which genes are essential can also depend on the environment a cell or bacterium is in. Mycoplasma genitalium , the growth media was both fructose and glucose. Knocking out a gene that transports fructose may not affect a cell that is in a glucose-rich environment, and knocking out a glucose transporter wouldn't affect it, either. But if both are knocked out, then the cell will die. So which gene is essential is not an all-or-nothing proposition. Hutchison, lead author of the study and a distinguished investigator at JCVI, noted that the minimal genome would also depend on what one wants the cell to do — a bacterium that glows in the dark will have a different minimal genome than something else. "There will be lots of minimal genomes," Venter said. Maria Lluch Senar, a staff scientist and biotechnologist at the Center for Genomic Regulation in Barcelona, Spain, said the achievement is exciting, because it has revealed a method for designing genomes that is much faster than the trial-and-error methods currently used. "The thing is here you can identify which is the minimal genome you want," she said, for a given function. "With this technique you can define which is the best combination of fragments of DNA … You can assemble them later on and generate different molecules that can be tested." "In theory, we could add gene sets and essentially recreate any organism," Venter said. "It would be an important experimental tool." That said, the technique promises better avenues for making germs that do everything from eating oil to making biofuels. "Our long-term vision has been to design and build synthetic organisms on demand where you can add in specific functions and predict what the outcome is going to be," said study co-author Dan Gibson, an associate professor at the Venter Institute. A minimal cell would devote the maximum amount of energy into whatever you designed the cell to do, and have less potential to mutate, and be easier to engineer, Gibson said. That ability to add gene sets could also aid in the understanding of why some bacteria evolved the way they did — and even life in general, though that's more of a stretch, Hutchison said. "We may be seeing some processes that occurred early in evolution," he said. "But [ Mycoplasma's genomes] are not small because they are primitive, they are small because they evolved from a cell that had a few thousand genes and they've lost genes that they don't need in their environment." Venter said the plan is to keep working on adding genes to the synthetic genome, to tease out the functions of the unknown genes. "We want to get to where we understand 100 percent of the genes in the organism, not just 66 percent." We have been hearing about Samsung’s plans to make foldable smartphones for sometime now and the company has also been talking regarding this technology for years. 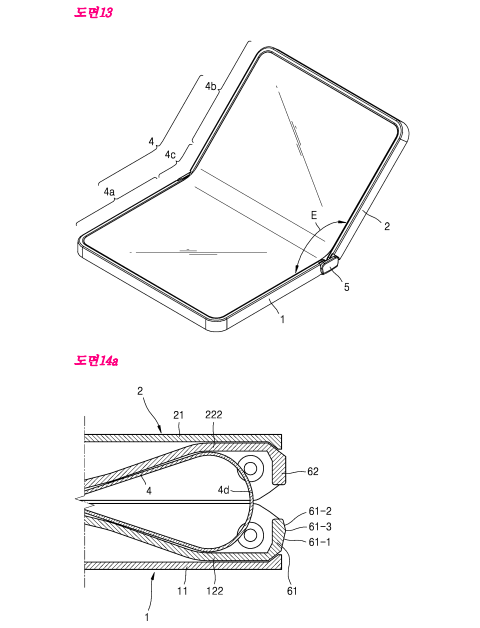 A recently filed patent application by Samsung has surfaced which shows the foldable smartphone tech in advanced development stage. 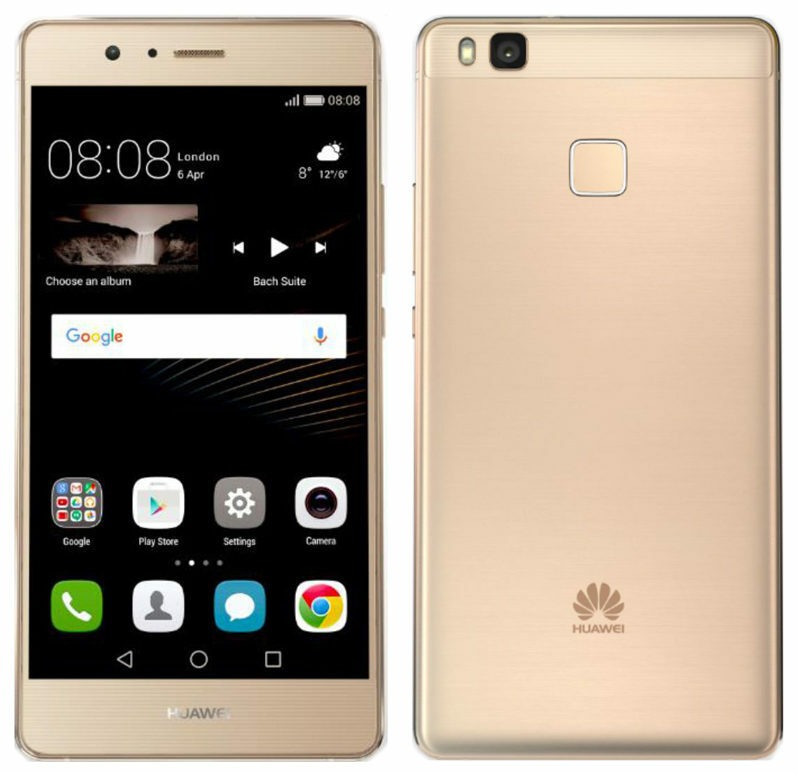 As per the images, the phone has a large display and the design shows a hinge that will be used to fold and unfold the phone. Also seen are various buttons on the sides of the phone but the trademark Samsung home button is missing. A camera sensor is seen in one of these images along with two magnetic studs that will ensure that the phone remains secure while folding and unfolding. Project Valley . The company had already patented a the foldable smartphone technology that described how dual display handset will be able to open and close in different configuration with the use of hinges. The above patent builds further on this tech and shows how the device will function. 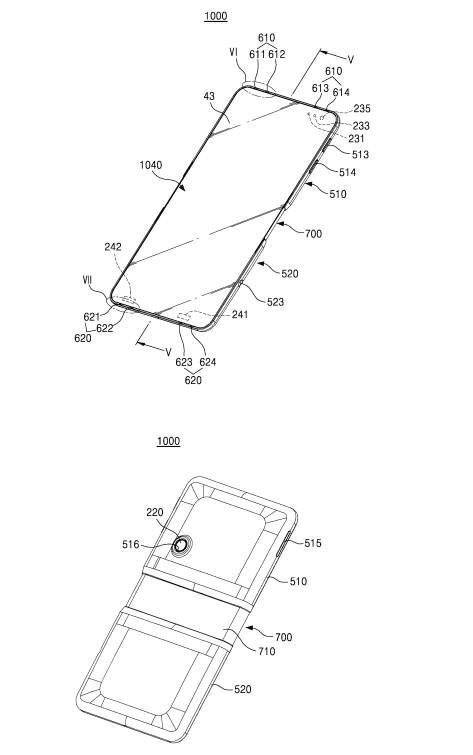 Samsung has been rumored to release a foldable smartphone in 2016 and may be the recent patent could be a move towards it. A company in France has developed a new smart umbrella that when paired with a smartphone app, can not only predict the weather but also send you a notification if you leave it behind. 'Oombrella', the smart umbrella is fitted with a capsule having sensors for air pressure, humidity, temperature and light. This setup allows the umbrella to tell whether or not it may rain in the next 15 minutes, notifying the user via a Bluetooth-connected smartphone with the corresponding app. It can also record weather data and can hold camera at the top. The capsule also has an integrated buzzer and light so that users can be alerted when they get a call. 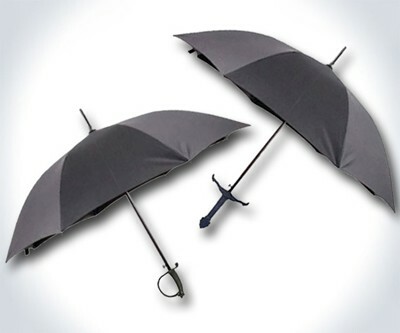 The ribs of the umbrella are made of Kevlar, a synthetic fibre of high tensile strength, TechTimes reported. According to the company Wezzoo, that developed Oombrella, the device is "really wind-resistant" with the capability of withstanding storms, hailstorms and snowstorms. The handle has a waterproof, ergonomic design that makes it easy to hold while ensuring that the components inside are not damaged by rainwater. The canopy is made from the "finest shiny material", and is UV-resistant.